Many modern energy dialogues gravitate toward a conversation about the present status of the jurisdictional divide between state and federal authority over the regulation of wholesale sales of energy. A March 3, 2017 Bureau of National Affairs (BNA) article began by observing how the utility industry believes the biggest challenges for the Federal Energy Regulatory Commission (FERC) will involve “[j]urisdictional battles between state and federal control in the energy markets.” And last fall, a joint report by centers at Duke University, University of North Carolina, and Harvard observed how “[t]he line between federal and state jurisdiction over the electricity sector is shifting. FERC once played a limited role in sector oversight, but regionalization of the electric grid and development of interstate markets for electricity, electric capacity, and transmission development have expanded its responsibilities.” A similar theme echoed in the Obama Administration Department of Energy (DOE) Quadrennial Energy Report. This jurisdictional conundrum primarily has played out on two fronts: first, whether state-related energy programs are preempted by the Federal Power Act (FPA), and second, whether such state programs run afoul of the dormant Commerce Clause. As the electric grid began expanding across state boundaries in the first quarter of the twentieth century, a similar question surfaced about which entities—whether states, the federal government, or regional agencies—ought to regulate sales and transmission of electric energy. Indeed, Justice Frankfurter and James Landis published a landmark 1925 article on the potential use of interstate compacts for promoting regional electric “superpowers,” an idea supported by such notables as Herbert Hoover. The Federal Power Commission (FPC), which at the time only enjoyed jurisdiction over hydroelectric facilities, opposed the development of such interstate compacts and instead seemingly favored expanding its own jurisdiction over interstate transactions. Two prominent pieces of Californian legislation that seek to address climate change are Assembly Bill 32 ("AB 32") and Senate Bill 32 ("SB 32"). AB 32 required California to reduce its greenhouse gas ("GHG") emissions to the 1990 level by 2020. It tasked the Air Resources Board with creating a Scoping Plan for reaching those levels. The original scoping plan contained a range of programs that would reduce GHG emissions from cars, trucks, fuels, industry, and electricity generation. SB 32 now requires the Air Resources Board to ensure that statewide GHG emissions are reduced to 40 percent below the 1990 level by 2030. The proposed Scoping Plan Update builds on the programs from the original Scoping Plan under AB 32 and includes some new ones. Programs under the Proposed Scoping Plan include the Cap and Trade Regulation, the Low Carbon Fuel Standard, the Renewable Portfolio Standard, the Sustainable Community Strategies, the Sustainable Freight Action Plan, and the Mobile Source Strategy, among others. The proposed Scoping Plan Update is comprehensive and commendable. However, it does lead to a few potential questions and issues. This paper will address two potential concerns regarding the transportation sector in particular. The transportation sector emits the most greenhouse gases of any economic sector in the state, so it is vital to reaching the SB 32 goal. The first concern is whether the new administration under President Trump will revoke California's waiver to regulate tailpipe emissions and how that affects the Scoping Plan. The second issue about the Scoping Plan is whether California will be able to install adequate infrastructure across the state to accommodate the increased number of zero emission vehicles. Malia McPherson is a 3L at Stanford Law School. This post is part of the Environmental Law Review Syndicate. On November 4, 2014, the voters of San Benito County passed Measure J, a voter initiative banning hydraulic fracturing (‘fracking’) and all other high-intensity petroleum operations within county lines. Under California law, only a subsequent voter initiative can overrule this fracking ban. While it is not the first county or city within California to take a stand against fracking, San Benito’s path to a successful ballot initiative was unique. Despite being dramatically outspent in the run-up to the election, the San Benito anti-fracking coalition San Benito Rising defeated industry interests through a simple strategy of basic grassroots organization. The movement was largely leaderless, it was community focused, and it represented both minority and majority interests. How did it succeed? Given the potential risks posed by fracking, and the legal context that left a regulatory ‘gap’ for Measure J to fill, the San Benito experience shows that it is indeed possible for community-centered lawyering and the voter initiative process to protect community environmental integrity on a precautionary basis against encroachment from outside interests. “Fracking” is the collective and colloquial term for the use of high volume hydraulic fracturing for fossil fuel extraction. Its purpose is to extract oil and gas from rock formations deep underground (in deep shale formations) with high-pressure ‘fracking fluids’. These fluids contain “significant amounts of water, sand, and chemicals” that fracture the rock layers to free the trapped oil or gas so it can be pumped out. With the passing of Joseph L. Sax this past spring, Berkeley Law and the global environmental community lost a beloved colleague, friend, mentor, and hero. At the time, we offered some words in his honor on Legal Planet. (link: http://legal-planet.org/2014/03/10/in-memoriam-joseph-l-sax-gentleman-scholar-giant-of-environmental-law/) We are very pleased to have another occasion to celebrate him here in Currents. The Environmental Law Section of the State Bar of California has quite appropriately named Joe as the recipient of its inaugural Lifetime Achievement Award in recognition of “his significant and profound role in shaping modern environmental law.” To celebrate Joe’s many and varied contributions we offer here three tribute essays. Joe’s longtime friend and colleague Dan Tarlock celebrates Joe’s role in the founding of environmental law with a remembrance of the Airlie House conference, often considered the field’s founding moment. Joe DiMento, a student of Joe’s at Michigan who became a co-author, friend, and close colleague, captures Joe’s scholarly brilliance and the global importance of his career, as well as his personal influence on students and others. Chris Carr, who also first encountered Joe in the classroom, remembers Joe as a towering figure in the field, a mentor, and an inspiring lunch companion. Together these pieces offer a picture of two vital aspects of Joe Sax: he was, of course, a leading scholar and advocate in the fields of environmental and natural resources for more than fifty years. He was also, just as importantly to the field and those in it, a teacher, mentor, and personal inspiration who brought many of us into the field, helped us develop our own expertise, and encouraged us to make our own contributions. The combination of these two sets of contributions ensures that while Joe is and will be deeply missed, his influence will continue far into the future. Environmental law did not evolve over a period of time, as have almost all areas of law. It was consciously created by a small group of lawyers and academics between the late 1960s and early 1970s. One of the seminal events in the creation of the field was the September 1969 conference held at Arlie House in northern Virginia. The Arlie House Conference was organized and funded by the conservation community. At that time, environmental protection meant primarily the protection of large areas of public land from development and the acquisition of private land for open-space preservation. Thus, it was natural that two pillars of the small conservation community in Washington, D.C., the Conservation Research Foundation and the Conservation Foundation, took the lead in bringing together a group of academics, lawyers, congressional aids, and others struggling to create a new field. The conference was a great success. As the introduction to the published proceedings accurately reported, it was a “fertile exchange among many lawyers who are breaking new ground,” and it helped create the notion that we in what soon became environmental law were part of a special community. In 1968, when the idea for the conference took shape, the task seemed daunting. Environmental values were ignored by the mission agencies, which were intent on pouring as much concrete and cutting as many trees as possible. The possibilities of obtaining standing to sue them and of finding a legal basis to challenge their New Deal-entrenched discretion seemed remote. As the Santa Barbara oil spill in January of 1969 reminded us, pollution was widespread despite the common law’s prohibition against nuisances. The conference’s first session, Problems of Litigation, featured papers by two “established” figures in the field. The lead paper, The Santa Barbara Oil Spill, was written by one of the forgotten pioneers of environmental law, Malcolm Baldwin. The second, Securing, Examining and Cross-Examining Expert Witnesses in Environmental Cases, was given by the rock star of the conference, David Sive, who died at age 91 just over a week after Joe. Dave had been one of the lead lawyers in the case Scenic Hudson Preservation Conference v. Federal Power Commission, which opened the possibility that courts could play a major role in creating environmental law. For the first time, a court had reversed an agency decision for the failure to adequately consider environmental values and potentially less-destructive alternatives. The session focused on the problems of bringing an action that could have prevented the spill as well as recovering post-spill damages. As someone who has been the victim of conferences that turn out to be nothing more than a lot of chitchat, it is my feeling that our discussion should be a prototype of a strategy session among lawyers trying to decide what to do when confronted with a problem like Santa Barbara. . . .
First, what if anything ought lawyers to do if a client comes to them with this potential problem? Ought there to be some kind of intervention? If so, at what point in the various processes of decision-making, leasing authorization, granting of permits, and so forth? Second, what expert scientific knowledge do we need and where do we look for it? And, third, what are the long-range effects of some kind of legal intervention? That is, what are we going to buy for the rather considerable expenditure of time and money that would go into it? Mr. Sanders: . . . [Y]ou will find that no ecologist at this time will say that he knows enough to establish what the ecology of the area is or should be . . . . A few of our ecologists say, yes, there has been great damage in the Santa Barbara oil spill. Others say no, there has not been any damage, and many say they don’t know yet, it is too early. . . .
Mr. Sax: Of course in every case we characterize as environmental, the problem of future uncertainties exists. But is it your conclusion that there is really nothing we can do? The much-revered Rabbi Hillel was once challenged by a potential convert who asked Hillel to teach him the whole Torah while he stood on one leg. The Rabbi replied: “That which is hateful unto you do not do to your neighbor. This is the whole of the Torah, the rest is commentary.” The same can be said of Joe’s career. All the characteristics that he displayed in his extraordinarily distinguished and justly revered career were on display that warm, northern Virginia morning. Joe was first and foremost a lawyer who acted like a doctor, as the best lawyers do. He diagnosed the illness first and then worked backwards to find a cure. Joe had a clear vision of what a new relationship between humans and nature should be, but he knew how hard it would be to achieve this vision. He saw law as one of many essential tools. He understood law as an envelope that was malleable but not infinitely so. Others in the field have gone further than Joe in trying to re-imagine an alternative environmental law based on a radically new human-nature relationship. But no one has gently but creatively pushed the legal envelope so effectively to advance the project of environmental protection in ways that were both fair and consistent with the rule of law. And he did it with modesty, grace, and humor. He stayed true to the spirit of Arlie House, and, for this, generations of his students, friends, lawyers, and many others will be eternally grateful for his career, even as they mourn his untimely death. Like many others, I am proud to call myself a fifty-year student and friend of Joe’s. No magic wand can be waved over the multitudinous problems of environmental quality. No elegant declaration of rights will simply and quickly solve our problems. Protracted struggle lies ahead, and the citizen fighting to vindicate his rights will be a central figure in that struggle. Regulation in the name of the public interest can no longer remain a two-party enterprise carried on between the regulated and the professional regulator. Effectuation of the public interest must begin to embrace the active participation of the public. This passage is characteristic of all the pioneering legal contributions of Professor Sax. His contributions and work were professional, innovative, and profound. I begin with “professional.” I had the joy of working with Professor Sax as a student, an assistant hearing-officer working for the government, a mentee, and a co-author. He modeled to me, and the many others who had the privilege to learn from him, not only how to be an advocate, but how to do so in a way that respects others' views, performs impressively, delivers superior results, and does so without fanfare or hubris. Some, when they hear "Joe Sax" or learn that Joe was an avid on-the-trails environmentalist, picture an informal person. But Joe was formal in all of the best connotations of that term. He taught us how to present clearly and impressively, how to articulate arguments persuasively, and even how to look when appearing before agencies, courts, legislators, and hearing boards. He taught us not that we would all reach the ideal standard, but rather how to be elegant in our work and how to represent environmental law. Professor Sax’s impeccable legal scholarship and advocacy was complemented by his innovation and creativity. He not only drafted the Michigan Environmental Protection Act—the Model Natural Resources and Environmental Protection Act, which demolished obstacles to citizen standing and created substantive rights in the public trust for the protection of the air, water, and other natural resources, as well as the public trust therein—but he also wrote persuasively of its doctrinal roots. And then he looked back—several times—using empirical methods to see how that Act and its many cousins throughout the United States were being used. He drew from his history, literature, and social-science knowledge, which made his work convincing, exciting, and based in critical worldly appreciations.
. . . any notion of the importance of protecting biodiversity builds on what may be thought of as the economy of nature, as contrasted with the transformational or developmental economy. In the economy of nature, land is not a passive entity waiting to be transformed by an owner. Nor is the world composed of distinct tracts of land. Rather the ecological perspective views land as a system defined by function, not by man-made boundaries. Land is already at work performing important functions in its unaltered state. Forests regulate global climate, marshes sustain marine fisheries, and prairie grass holds the soil in place. In the economy of nature, wetlands would be governed by laws based on their ecological role, not on lines drawn on a map. And their protection would be the responsibility of all those whose activities—wherever carried on—adversely affected them. If today we are seriously to protect what remains of our biological heritage, to restore degraded rivers and landscapes, and to redeploy forests to play a positive role in controlling human-induced climate change, we need a legal system that is as well-attuned to achieving those goals as the conventional legal system we have inherited was attuned through transformation of nature to achieving the goals of the industrial revolution. No jargon, no superfluous phrasing: the passage is clear, communicative, and transformative. Professor Sax did not write unless he had something important to say, and when he said it, he said it beautifully. One of my lasting memories is of his workmanship. In his lovely wood-paneled office in the Michigan Law Quad, he would type a triple-spaced draft of a manuscript. The editing of that draft would be craft—with handwritten additions noted clearly and precisely in the margins and the interval spacing. Then another draft, then another, and then one read by his wonderful wife Ellie, until every phrase was as clear as possible. Triple spacing and elegant editing. I have tried to emulate and teach this not-so-mysterious method to my students for decades. When a group of Japanese historians asked me to give a lecture on environmental law with an emphasis on the 1960s, my first thought was “Joe.” Professor Sax represented the roots of the most important thinking on law and the environment, not only in the United States, but in other places, including my host country of Japan, India, and the larger international community. Professor Sax made Minamata a name that would haunt the world and lead to major reforms in environmental safeguards, both in Japan and elsewhere. He made citizen environmental action, then a revolutionary notion, a household concept—something that is talked about on network morning television and described in popular magazines. He added to the public-policy calculus a serious consideration of a public trust in nature. He moved us to think about property in ways that society must consider if our natural environment is to be sustainable. He was consistently on the cutting edge in his career. More recently, he laid out new ideas for addressing the effects of contemporary environmental challenges by writing about the arcane doctrines of accretion and avulsion in property law, which are deeply relevant in times of climate change. Professor Sax changed the way the government and private entities can treat our beloved streams and countryside, our water, our mountains, and our wilderness, critters, and patrimony. Very few people influence the way societies approach these kinds of challenges, the challenges that matter most, as Joe did. But Joe also deeply affected the way we think about and view people around us—both friends and enemies. —Who treated others based on their potential. Joe was committed to, and confident about, a specific set of values, which directed his choices and actions. No temptations or incentives could change those values. It sounds simple, but how many of us at our life’s end will be described that way? —His inspirational love for Ellie and how they cared for one another throughout their long and happy marriage, and most inspirationally, in the last couple of years. —His guidance and understanding of his three wonderful and very different daughters. —The name of one of his most important contributions: “The Sax Act” (although he was always a bit sensitive to teach it to young students under that name).
. . . something that few can emulate: that expression when he patiently responded to a question that may have not been as well thought-out as one could have hoped . . .
An imperfect approximation. If you knew him, I am sure you can picture it, even if you were never its subject. I am honored to provide the perspective of a student, practitioner, and friend on Joe Sax’s lifetime of contributions to the field of environmental law, so deservedly recognized by the California State Bar in posthumously bestowing upon Joe its inaugural Lifetime Contribution Award. Joe had a profound influence on my life—professional and otherwise—over the last twenty years. Not a day goes by that he does not come to mind. I’m confident that this would be so even if I didn’t happen to be a practitioner of environmental and natural resources law, because Joe’s shining example illuminates many parts of my life. I will come back to Joe’s powerful influence on my individual professional development, but it is appropriate to begin with a brief comment on Joe’s monumental and revolutionary impact on the course of environmental and natural resources law over the last fifty years. A modest and measured man, Joe would surely resist such a grand characterization. But it is unquestionably true. Joe is in fact the leading figure in the field over this period. Joe’s role in launching the public trust doctrine is well known, but to this could be added a staggering list of achievements: his responsibility for Michigan’s model environmental review statute, his pathbreaking work in support of citizen suits, his scholarship and advocacy in the field of takings law, his decades-long co-authorship of the leading casebook on water law, his work on important water rights disputes around the United States and as expert consultant to governments around the world on water issues, his scholarship about and support of our national parks (including his pro bono work for the National Park Service), his work (both within government and without) on biodiversity conservation, and, more recently, his scholarship in the area of cultural preservation. The list of important, pressing issues in the field of environmental and natural resources law to which Joe devoted his historical capaciousness, humanistic sensitivity, and formidable powers of analysis goes on. But Joe’s influence has not been limited to the evolution of environmental law and policy itself. He has profoundly shaped the intellectual and personal approaches of several generations of environmental lawyers, public officials, academics, and others who grapple with the perennial yet ever-changing challenges of how we relate to and interact with the environment. Whether Joe was teaching his students at the University of Colorado, the University of Michigan, or the University of California, Berkeley, one of his core messages—taught by example—was that “these issues are not easy, and working through them requires patience and concerted thought.” I carry this habit of mind with me to this day, as no doubt countless other of Joe’s students do. It informs our professional work and how we relate with our fellow citizens. My own experiences with Joe are but one data point, but I believe they illustrate his great influence on students. I met Professor Sax in the spring of 1993 as a student at Boalt Hall, where I was also a doctoral student in the Jurisprudence and Social Policy Program. Like many students, I did not have any firm sense of what I wanted to do professionally, but I had done some work on international ocean law as a research assistant the prior year and thought that domestic environmental law might be worth exploring. I signed up for Professor Sax’s Public Land Law course. I only wish I had “discovered” Professor Sax earlier in my law school career. I would have taken more of his classes. The course proved immensely rewarding, introducing for consideration all of the complexities of managing public lands and resources for multiple uses, within a federal system, in a democratic society. It was an introduction not only to federal resource management, but also to the administrative law system and judicial review of agency action. The course illustrated the intellectually rich confluence of law, science, and policy that characterizes American environmental and natural resources law. Although, as I would later appreciate, Professor Sax had his own views on the appropriate resolution of the issues presented in the course, his teaching conveyed the unmistakable message that the issues needed to be engaged deeply, with rigor, and with an appreciation for the perspectives of others. My appetite whetted for more, I signed up for Professor Sax’s Public Trust Seminar in the fall 1993 semester. Over the summer, I had learned that Professor Sax was the progenitor of the contemporary public trust doctrine, which was so critical and transformative in California water and resources law. Joe sparked its modern revival with his seminal article in the 1970 Michigan Law Review, The Public Trust Doctrine in Natural Resource Law: Effective Judicial Intervention. Joe’s seminar was an intellectual feast, tracing the doctrine from its origins in Roman law, through its treatment by the U.S. Supreme Court in the Illinois Central Railroad case in the late nineteenth century, to its assertive application and expansion by California courts in the 1970s and 1980s. Joe assigned all seminar students a weekly problem to answer in a one-page paper, which he carefully graded and provided written feedback on. Students also had to produce a seminar paper, to which Joe devoted great time and attention. I finished mine only the next spring, when I had already moved to Washington D.C., because I was (delightedly) responding to Joe’s repeated follow-up questions. This seminar provided another lesson that informs my work (and, again, doubtless that of countless other of Joe’s students) to this day: every day as an environmental lawyer, you play a critical role in helping society mediate, in a thoughtful way consistent with the rule of law, transitions and transformations in what we collectively value about our environment and natural resources. I next had the privilege of spending time with Joe in 1995 in Washington, D.C. Joe had come to Washington in 1994 to serve as Counselor to Secretary of the Interior Bruce Babbitt. I was completing a year at the State Department’s Office of Marine Conservation, and Joe hired me to work as an assistant to him at the Interior Department at the beginning of 1995. The new Congress had just been elected, and the Gingrich Revolution took aim at the federal Endangered Species Act and included takings legislation as part of its Contract with America. Joe was asked to head up the Clinton Administration’s defense of the ESA and federal environmental regulation generally. I helped Joe prepare position papers, Congressional testimony, and the like in support of this effort. Joe’s effective and successful advocacy for the ESA and reasonable environmental regulation in the highly charged political environment of Washington, D.C. in 1995 vindicated the ideal that in our democracy there remains a role for serious, rigorous thought in the environmental policy-making process. I went off to a judicial clerkship later in 1995, and Joe returned to Berkeley in 1996. 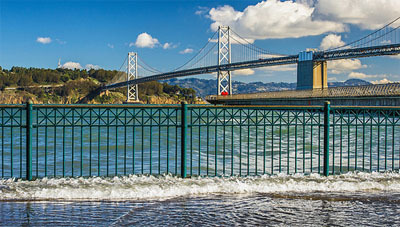 I returned to the Bay Area in 1996 and started legal practice at a boutique natural resources firm in San Francisco. In subsequent years Joe was a regular lunch companion. We enjoyed sharing the problems and issues we were working on, as well as engaging in wide-ranging discussions about political economy. I would frequently ask myself: “What would Joe say about this?” Then I would have the privilege of soon finding out over lunch. I still find myself frequently asking what Joe would think, but, to my deep regret, I’m now left to conjure answers as part of an inner dialogue. From the perspective of preserving biological and genetic integrity, by which contemporary environmental opinion measures success, the parks (for all their wonders) are seriously deficient. If our parklands are to provide, in any degree, what we are now asking of them, far-reaching changes will have to be made. A great deal of land, both public and private, the use of which affects the parks and their resources, is going to have to be managed more sensitively. The matter I am handling involves issues of the carrying capacity of Muir Woods and parking for its visitors. Managing visitor numbers is important not only for ensuring an appropriate visitor experience, but also to minimize the impacts of visitors on the sensitive environment surrounding Muir Woods. Redwood Creek, home to one of the last native coho salmon runs in California, flows through the heart of Muir Woods before spilling into the Pacific Ocean. Signs in the Muir Woods parking lot direct “overflow” visitor vehicles to park on the shoulder of Muir Woods Road, perched above Redwood Creek. I have a pretty good idea what Joe would say about this. I have practiced environmental and natural resources law for almost twenty years, and I am fortunate to serve as head of the Environment and Energy Practice Group at Morrison & Foerster. I am forever indebted to Joe for his essential role in sparking my deep and abiding interest in environmental law, as well as instilling in me the habits of mind necessary to be a successful practitioner in this area. Once again, I am sure I speak for innumerable practitioners whom Joe taught at the University of Colorado, the University of Michigan, and the University of California, Berkeley. Joe’s seminal article on Takings and the Police Power was published by the Yale Law Journal fifty years ago this fall. So it is fitting for the State Bar to honor Joe with its inaugural Award for Lifetime Contribution to the Field of Environmental Law in this fiftieth anniversary year of his leadership in the field. The State Bar’s award recognizes that Joe has bequeathed to the public a rich and robust body of scholarship, law, and policy. We practitioners, most especially, hold that body of work as a public trust. This trust continues to help our increasingly complex and changing society make thoughtful decisions about the values we collectively pursue in using and protecting the environment and natural resources of which we are, necessarily, stewards for future generations. Distinguished Professor of Law; Chicago-Kent College of Law. Law and the Environment (Malcolm F. Baldwin & James K. Page, Jr., eds., 1970). Edward Berlin et al., Law in Action: The Trust Doctrine, in Law and the Environment, supra note 2, at 166. Malcom F. Baldwin, The Santa Barbara Oil Spill, in Law and the Environment, supra note 2 at 5. David Sive, Securing, Examining and Cross-Examining Expert Witnesses in Environmental Cases, in Law and the Environment, supra note 2 at 48, reprinted in 68 Michigan Law Review, 1175 (1970). Scenic Hudson Preservation Conference v. Fed. Power Comm’n, 354 F.2d 608 (2d Cir. 1965). Law and the Environment, supra note 2 at 67. Copyright Holly Doremus, Dan Tarlock, Joe DiMento, and Chris Carr 2014. All rights reserved. In today’s world, millions of people lack access to sufficient quantities of food to meet recommended dietary needs. As the world’s population grows, global demand only increases for food and fiber. These shortages are occurring despite significant increases in the production of food resulting from new and modified practices including the more intense use of land resources, irrigation, plant breeding, genetically modified crops, advances in technology, improved agricultural management practices, and the use of pesticides. 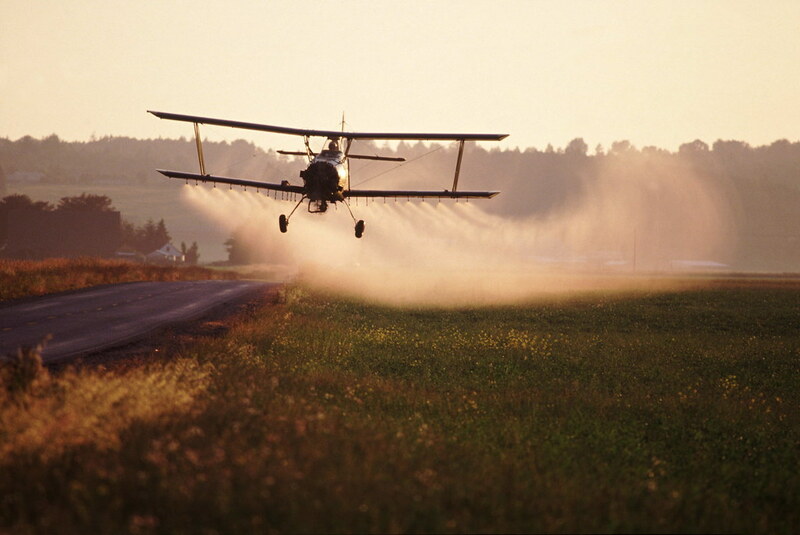 A crop duster spraying pesticides. Photo courtesy of tpmartins. Pesticide use inherently involves risks to humans and the environment. One of the risks is the possibility that spray applications will cause particles to drift onto neighboring properties causing damages The registration of a pesticide covers the possibility of spray drift. Labels warn applicators that the pesticide must be applied in a manner to preclude particles or droplets from being carried onto neighboring properties. Applicators who fail to follow label instructions are liable for damages. Applicators following label instructions may also incur liability under common law if they cause pesticide drift to enter properties of others and cause damages. While pesticide particles carried by air currents may injure people, the most frequent claim for damages is drift from an herbicide that is carried onto nontarget agricultural crops. Pesticide particulates may also drift onto nontarget organic crops and lead to damages. For these situations, persons suffering damages need to present evidence that establishes liability under a common law cause of action. Generally, plaintiffs who can show that defendants breached a label instruction or regulatory provision can succeed in recovering damages. However, for claims not involving labeling or regulatory provisions, plaintiffs need to establish trespass or another common law cause of action as a basis for the recovery of damages. These claims prove challenging for plaintiffs to establish. Due to the common usage of pesticides, strict liability is generally not available as a cause of action. Nuisance may be defeated by an anti-nuisance defense. FIFRA preempts negligence claims concerning labeling, and remaining negligence claims tend to be difficult to prove. This means that persons injured by spray drift damages often seek to sue in trespass. Yet, the intangible nature of spray drift makes it difficult for plaintiffs to meet the requirements for a trespass claim. States’ approaches to trespass for securing damages resulting from spray drift vary, and this can mean that plaintiffs must carefully plead interference with exclusive possession together with injury to a res, meaning substantial property damages or damage that is physical, to establish their cause of action in trespass. Trespass involves an invasion of the interest in exclusive possession of land. Every unauthorized entry of a tangible object creates a trespass, even in the absence of damages. Entry need not be by a person, as an actor may invade another’s interest in exclusive possession by intentionally propelling a thing onto the surface of the land. Moreover, intent in a jurisdiction may be described broadly to include a person who has reason to be aware of the consequences of an act, including inadvertence or mistake. Persons suffering injuries for pesticide spray drift often allege a trespass, and state jurisprudence on trespass will determine whether the facts support a finding of liability. Invasions of spray drift may not meet the requirements prescribed for tangible objects because airborne drift is considered to be an intangible substance. In the absence of a tangible object, courts have determined that there is no interference with exclusive possession. Furthermore, as an intangible substance, jurisprudence used for odors, dust, smoke, noise, and electromagnetic fields may be applied to actions involving spray drift even though drift is different from these other intangibles. An examination of claims involving intangible substances discloses three features that limit the success of a trespass lawsuit for pesticide spray drift. The first feature involves a limitation on trespass actions because spray drift is considered an interference with the use and enjoyment of land, and plaintiffs have a remedy under nuisance law. Second, state jurisprudence may hold that spray drift does not interfere with the plaintiff’s exclusive possession. Third, a court may require that intangible intrusions need to result in injury to a res. An evaluation of these separate features means that a claim for damages resulting from spray drift requires a careful accounting of the facts to qualify as a trespass under state law. Sources of environmental contamination with pesticides. Image courtesy of Roy Bateman. Courts in some states have justified their denial of liability under trespass for spray drift damages by the presence of the alternative remedy of nuisance for invasions of intangible substances. Because intangible substances interfering “with an owner’s use and enjoyment of land” are nuisances, an action in trespass is not needed. The availability of nuisance law provides adequate redress for persons suffering damages from pesticide drift. In 2012, the Minnesota Supreme Court drew upon the distinctions between nuisance and trespass when responding to allegations of damages for spray drift in Johnson v. Paynesville Farmers Union Cooperative Oil Company. The court noted that spray drift was an intangible agency. After observing that traditional distinctions between nuisance and trespass have become blurred, the court acknowledged an earlier decision in which invasive odors from a confined hog operation were not recognized as a trespass. Given this precedent, the court found that an intrusion of pesticide spray drift could not constitute a trespass as intangible invasions in Minnesota provide plaintiffs a cause of action in nuisance. Trespass involves an invasion of a plaintiff’s right to exercise exclusive possession of land while nuisance involves interference with a plaintiff’s use and enjoyment of the land. The drift of pesticides did not result in a tangible object invading plaintiffs’ land, so it was not a trespass. Nuisance law provides remedies for intangible invasions. A court in Connecticut reached a similar result. Responding to a claim for damages from electromagnetic fields, the court noted that there was no substance or thing entering the plaintiff’s land. This led the court to decline to find a trespass, since intangible intrusions can be dealt with as nuisance cases. Likewise, a court in Michigan sought “to preserve the separate identities of trespass and nuisance” when considering intrusions of dust, noise, and vibrations. The Michigan court felt that proving real and substantial damages and balancing them against the usefulness of the offending activity should not apply to trespass law because it would endanger the right to exclusion. Yet, American jurisprudence generally is open to allowing claims under both trespass and nuisance. The torts of trespass and nuisance address separate interests. Implying that invasions of particles constituting nuisances should not also be considered as trespasses runs counter to giving full recognition to factual situations and injurious behavior. If both interests have been infringed by an invasion of particles, an injured plaintiff should be able to initiate a legal action under both causes of action. Given distinctions in burdens of proof, statutory defenses, and statutes of limitations, it seems incongruous not to allow plaintiffs to allege both causes of action. Trespasses require an unauthorized intrusion that interferes with the exclusive possession of land. The issue for spray drift is whether particles flowing onto a nontarget site actually interfere with the plaintiff’s exclusive possession. Some courts note that an interference with exclusive possession requires a tangible invasion so that intangibles such as spray drift cannot constitute a trespass. Other courts have recognized distinctions between invasions of intangible substances such as light or sound that may not physically interfere with the possession of property versus intangibles that do cause an interference. If intangible spray drift is determined to physically interfere with exclusive possession, the facts support an allegation of trespass. However, whenever the entry of an intangible substance is less disruptive and does not interfere with a landowner’s exclusive possessory interest, a court might find that the substance does not require that the landowner share possession. Without a showing of an interference with exclusive possession, there is no trespass in these situations. Photo courtesy of Djuradj Vujcic. Returning to the Johnson case in which the Minnesota Supreme Court considered an allegation for damages from pesticide spray drift, the court noted that a trespass traditionally required “some physical, tangible agency,” as opposed to intangible substances entering another’s property. The court proceeded to dismiss the plaintiffs’ trespass claim, holding that there was no interference with an exclusive possessory interest. Instead, the court found that the facts, if proven, would show the spray drift interfering with the plaintiffs’ use and enjoyment of their land. The recent Macalpine v. Hopper case from Colorado shows that given sufficient pleadings, a court may find that pesticide drift interferes with exclusive possession. The court concluded that the physical intrusion of spray drift contaminants was a physical invasion because the plaintiffs had “felt the effects of the [defendants’] spray.” Given the physical nature of the spray residue, the Colorado court found that the spray drift constituted a trespass that did not require proof of actual damages. To establish a cause of action in trespass for an invasion by an intangible substance, courts in a number of states have delineated an additional requirement involving substantial damages to a res, or thing. While historic trespass law did not require damages, adding a requirement of damage to a res for intangible substances means that trespass law demands an interference with the right of possession. The requirement of damages or injury means that intrusions of intangible substances occurring as part of normal activities are not trespasses. For example, ambient air almost always contains particles from many sources so that invasions of expected and ordinary particles are not trespasses. But concentrations of intruding particles that cause significant interferences may constitute a trespass if they injure a res. A leading authority for the requirement of substantial damages is Borland v. Sanders Lead Company, an Alabama case involving the trespass of lead particulates and sulfoxide gases. The Alabama Supreme Court decided that intangible invasions of property interests interfering “with the right to exclusive possession of property” were trespasses. The court determined that trespass is not dependent upon whether the intruding substance is tangible or intangible and that invisible pieces of matter or energy intruding on property could constitute a trespass. However, for a trespass by intangible substances under Alabama law, the court delineated four requirements: an invasion, intentional doing of the act, reasonable foreseeability, and substantial damages. Borland and others created the “modern view” of trespass law. Intrusions of intangible particles may constitute a trespass if they meet a further requirement of substantial damages to the res. By incorporating a requirement of substantial damages, trespass can be used to address invasions of intangible substances. While intrusions of particles and droplets causing damages to property may be trespasses under this jurisprudence, intrusions of light, odors, and electromagnetic fields generally are not trespasses. Substantial damages to the res show an interference with exclusive possession so that the intrusion of intangible particles constitutes a trespass. Rather than focusing on substantial damages to a res, some courts have espoused a requirement involving physical damage to the plaintiff’s property. Interpreting Colorado law, the Tenth Circuit Court of Appeals considered a trespass allegation involving a release of plutonium particles that contaminated plaintiffs’ properties. Since the particles were impalpable, the court found them to be intangible and required a showing of physical damage to find liability. Upon remand, the plaintiffs would be required to prove “actual physical damage to their property” to establish a trespass for the invasion of intangible particles. A federal district court in Missouri interpreted the state’s law to enable plaintiffs to maintain a trespass cause of action for stray electricity that allegedly had a deleterious effect on their electric motors and appliances and accelerated corrosion of metal structures. By alleging actual physical damage by the escaping electricity, the plaintiffs had presented sufficient evidence to maintain a cause of action in trespass. Other courts require some type of physical presence by examining whether the facts show an intangible substance being deposited on the plaintiff’s property. The Fifth Circuit Court of Appeals considered allegations of a trespass by airborne heavy metals that contaminated plaintiffs’ properties and caused other damages. The court found that Texas law allowed trespass actions for airborne particulates if they deposited some “thing” on the plaintiffs’ properties. Because the plaintiffs had introduced evidence that the airborne particulates were deposited on their properties, they had established evidence of a trespass. 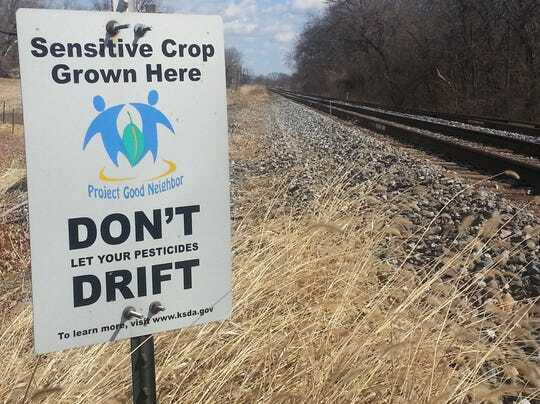 A sign placed by the Kansas State Department of Agriculture alerts farmers to crops sensitive to pesticide and herbicide drift. Photo courtesy of Kansas State Department of Agriculture. Plaintiffs bringing actions for invasions of intangible objects in states with historic limitations on trespass law will need to differentiate their situations to overcome judicial precedents. This may be achieved by introducing detailed evidence to establish a trespass that distinguishes the case from whatever limitation was present in an earlier decision. The facts and evidence of some pesticide drift cases lend themselves to differentiation and qualification as a trespass. In rare situations, plaintiffs may have been present during the spraying and seen and felt the spray drift coming onto their property. This evidence existed in a Colorado case and was used, with further affidavits, to establish liability under trespass law. The plaintiffs showed that the Malathion residue on their property came from the defendant and that there were no other spray applications that would account for residues. Without acknowledging a physical invasion, the court found the evidence sufficient to grant the plaintiffs summary judgment on the trespass claim. In most spray drift cases, plaintiffs will not have felt the effects of the spray drift so other evidence is required to establish a trespass. Typically, this will involve damages to a crop. As soon as a problem is noted, a plaintiff will need to evaluate the situation to determine whether sufficient evidence can be obtained to establish liability and whether the damages are sufficient to invest in efforts to secure relief. Gathering evidence to establish causation and prove a trespass will require the assistance of experts who know what to look for, what is needed, and can perform the necessary tests to relate the pesticide drift to injuries. Plaintiffs generally will need to introduce evidence of physical damage to plants related to a defendant’s spray activities to establish a trespass. An agronomic inspection and tissue samples from the affected area can form the basis of evidence of pesticide damage. The samples would undergo testing using liquid and gas chromatographic methods with mass spectrophotometric detection to identify the culprit pesticide residue. This evidence will need to be gathered immediately as plants rapidly metabolize some pesticides and, in some cases, residues may no longer be present in dead tissue. Samples may need to be chilled or frozen to preserve evidence of a pesticide residue. Moreover, documentation of the chain of custody of the samples will need to meet evidentiary standards. A plaintiff will also need to secure the spray records of all possible neighbors whose actions might have contributed to the damages. With information on the dates of applications of pesticides, a plaintiff can match residue samples to a specific pesticide used by an applicator. Next, the plaintiff can document information on the wind and climatic conditions of the day of the pesticide application to show a relationship between the defendant’s action and the drift damages. Further, the plaintiff may gather affidavits from other neighbors documenting the nonuse of the culprit pesticide to support the claim that the pesticide causing damage came from the defendant. With the information from the samples and records of pesticide usage, the plaintiff would need one or more experts on crop damages to offer testimony as expert witnesses. The experts would explain that the damage to the plants was consistent with the application of the culprit pesticide, how the pesticide affected the growth and development of the crop, and the amount of the financial loss suffered by the plaintiff. For states in which courts have found that intangible invasions do not interfere with a landowner’s exclusive possession of land, plaintiffs may be able to distinguish that a deposit of spray has interfered with their possession. Agricultural producers use their properties to grow crops that they sell to others. Any action by an unauthorized person that denigrates a crop interferes with the owner’s exclusive right to use property for crop production. The unauthorized physical injury to plant material caused by a defendant’s spray drift constitutes an interference with a plaintiff’s exclusive possession. With the careful documentation of spray drift damages, a plaintiff can distinguish the case from established precedents that declined to recognize trespasses by intangibles. This might start with an explanation on how an action in trespass for spray drift is different from actions concerning dust, electromagnetic fields, or vibrations. The evidence from the testing laboratory showing the presence of an unauthorized deposit of a pesticide would constitute evidence of an invasion of a plaintiff’s property with a deposit that caused physical damage. This evidence would distinguish spray drift from other types of invasions that lack deposits. Moreover, the physical damage would establish interference with a plaintiff’s exclusive possession. The evidence would enable the court to differentiate earlier precedents that declined to recognize a trespass action for entry of intangibles. For example, a court concluded in a spray drift case from Vermont that the plaintiffs failed to demonstrate a “physical impact” on property so were not able to establish a cause of action in trespass. This precedent does not preclude a subsequent plaintiff from developing evidence that documents a physical impact. Through an orderly documentation of the defendant’s actions, a plaintiff could establish injury to plants from a pesticide used by a defendant. Through the introduction of evidence of destruction of plants or stunting or physical alteration of growing plants, a plaintiff can present evidence of physical damage. This suggests that in some spray drift cases, a plaintiff should be able to assemble the necessary documentation to meet the requirement of a physical impact. Another problem with trespasses by intangibles such as dust has been the absence of “proof of damage to the invaded property.” An allegation of trespass with evidence of a documented deposit of a pesticide interfering with exclusive possession that caused physical damage supports a trespass. A conclusion that the facts of a spray drift case present sufficient evidence to maintain an action is trespass would not change trespass law for most intangible invasions. Only invasions with a deposit clearly related to physical damages would qualify as a trespass. Activities that generate intangible substances that are carried in the air onto properties of others present courts with difficult questions concerning liability for damages. Because different intangible substances pose greater dangers and inflict greater harm than others, some states have proceeded to differentiate particles from intangibles such as odors, noise, and radiation waves. The distinctions suggest that attempts to treat all intangible substances as similar are misplaced. While ambient air may always contain intangible substances, this should not mean that unnatural concentrations of particles from human activities damaging properties of others cannot be a trespass. Persons causing particles to invade properties of others to damage a possessory interest in property are trespassing. A Texas court concluded particles were a “thing” that could invade another’s property and constitute a trespass. Evidence that the plaintiff photographed an intrusion and smelled and felt the spray drift led a Colorado court to conclude that the existence of particles was a trespass. States adopting a “modern view” of trespass law allow recoveries for invasions of intangible substances if there are substantial damages or physical invasions. Alternatively, the jurisprudence of at least one state provides that intangible particles constitute a trespass without a showing of actual or substantial harm. The existence of a nuisance cause of action should not impinge a plaintiff’s right to recover damages under trespass law. This is particularly important whenever an anti-nuisance statute shields an invasion of spray drift or when a statute of limitations has expired for a nuisance claim of action but not for trespass. Although trespass law is not as amenable as nuisance for balancing equities, the rights of persons generating intangible substances and those claiming injuries from the substances may be reconciled under trespass law. This is accomplished under the “modern view” of trespass law by requiring a plaintiff to show substantial damages to a res or physical damage. State law may be expected to evolve so that plaintiffs suffering damages from an unreasonable invasion of an intangible substance can secure relief under trespass law. Copyright © 2014 Terence J. Centner. * Terence J. Centner is Professor of Agricultural and Applied Economics at the University of Georgia and his teaching program involves environmental, public health, and agribusiness law courses. He focuses on policy analyses of current issues confronting agriculture and the environment.
. It is estimated that one in seven people lack access to sufficient protein and energy in their diet. Charles J. Godfray et al., Food Security: The Challenge of Feeding 9 Billion People, 327 Sci. 812, 812 (2010).
. It is estimated that by 2050 the world will need 70 percent more food due to increasing population and changes in diets. József Popp, Károly Petö & János Nagy, Pesticide Productivity and Food Security: A Review, 33 Agronomy Sustainable Dev. 243, 243 (2013). Population growth is also accompanied by an increase in the demand for water for the production of food crops. Henry Vaux Jr., Water for Agriculture and the Environment: The Ultimate Trade-off, 14 Water Poly 136, 137 (2012). Due to insufficient irrigation water, millions of people will be condemned to starvation. Id.
. See Uwe A. Schneider et al., Impacts of Population Growth, Economic Development, and Technical Change on Global Food Production and Consumption, 104 Agric. Sys. 204, 205 (2011) (noting that intensification of water, fertilizer, pesticides, machinery, and labor has increased food production).
. See David Molden et al., Improving Agricultural Water Productivity: Between Optimism and Caution, 97 Agric. Water Mgmt. 528, 530 (2010) (observing potential crop production gains from irrigated crops by reducing plant transpiration).
. See Godfray et al., supra note 1, at 813 (noting the Green Revolution using plant breeding to increase crop production); Eyal Fridman & Dani Zamir, Next-generation Education in Crop Genetics, 16 Current Op. Plant Bio. 218, 219 (2012) (reporting on the dramatic increases in yields due to hybrids); Mark Tester & Peter Langridge, Breeding Technologies to Increase Crop Production in a Changing World, 327 Sci. 818, 818 (2010) (calculating a linear increase in food production globally of 32 million metric tons per year due to breeding and agronomic improvements).
. Genetically modified crops can decrease losses from pests and increase yields by eliminating competition from weeds. See Parvaiz Ahmad et al., Role of Transgenic Plants in Agriculture and Biopharming, 30 Biotech. Advances 524, 525 (2012) (identifying wheat, rice, and soybean as important transgenic crops that have increased food supplies).
. Technologies enable agricultural production to be intensified through the employment of more water, fertilizer, pesticides, and machinery. Schneider et al., supra note 3, at 205.
. For example, improvements in a crop’s ability to use less water or saline water may lead to greater yields. Tester & Langridge, supra note 5, at 818 (reporting ideas for production increases).
. See Charles M. Benbrook, Impacts of Genetically Engineered Crops on Pesticide Use in the U.S —The First Sixteen Years, 24 Envtl. Sci. Eur. 1, 1–13 (2012) (reporting on genetically engineered plants and the usage of pesticides in the production of food crops).
. See, e.g., Adriane J. Busby & Gabriel Eckstein, Organophosphates, Friend and Foe: The Promise of Medical Monitoring for Farm Workers and Their Families, 27 UCLA J. Envtl. L. & Pol’y 39, 50–68 (2009) (discussing the protection of farm workers from pesticides).
. 7 U.S.C. § 136j(a)(1) (2014). However, nonregistered pesticides may be produced and exported to other countries. 7 U.S.C. § 136o (2014). See Michael Holley, The EPA’s Pesticide Export Policy: Why the United States Should Restrict the Exports of Unregistered Pesticides to Developing Countries, 9 N.Y.U. Envtl. L.J. 340, 343–48 (2001) (discussing the requirements for exporting unregistered pesticides).
. 7 U.S.C. § 136d(b)-(c) (2014). See Christopher M. Iaquinto, Note, A Silent Spring in Deep Water? : Proposing Front-end Regulation of Dispersants after the Deepwater Horizon Disaster, 39 B.C. Envtl. Aff. L. Rev. 419, 437 (2012) (noting the ability of EPA to cancel or suspend the registration of a pesticide).
. 7 U.S.C. § 136j(a)(2)(G) (2014). See Peconic Baykeeper, Inc. v. Suffolk Cnty., 600 F.3d 180, 188 (2d Cir. 2010) (finding that the district court did not explain how it found the spraying to be in compliance with the FIFRA label).
. See, e.g., John Wargo, Our Children's Toxic Legacy: How Science and Law Fail to Protect Us from Pesticides, Yale Univ. Press, 1998 (arguing that the U.S. government’s policies on pesticides have neglected adequate consideration of exposures and the risks faced by children).
. See, e.g., Theodore A. Feitshans, An Analysis of State Pesticide Drift Laws Revisited, 20 San Joaquin Agric. L. Rev. 23, 23–29 (2010–2011) (recounting state regulations governing pesticide spray drift); Theodore A. Feitshans, An Analysis of State Pesticide Drift Laws, 9 San Joaquin Agric. L. Rev. 37, 40–67 (1999) (introducing the issue of state regulation of pesticide spray drift).
. 40 C.F.R. § 158.130(g) (2014) (requiring data that evaluates pesticide spray drift derived from studies of droplet size spectrum and spray drift field evaluations). Further regulatory provisions delineate a table for determining spray drift data. 40 C.F.R. § 158.1100 (2014).
. See Constantino Vischetti et al., Measures to Reduce Pesticide Spray Drift in a Small Aquatic Ecosystem in Vineyard Estate, 389 Sci. Total Env’t 497, 497 (2006) (reporting on the need to employ spray drift management to reduce damages from drift).
. Plaintiffs have the burden of proving that a pesticide applicator failed to follow directions. See Orkin Exterminating Co. v. Carder, 575 S.E.2d 664, 666 (Ga. Ct. App. 2002) (affirming damages for pesticide applications where evidence showed the defendant had failed to comply with label instructions); Kleiss v. Bozdech, 811 N.E.2d 330, 354 (Ill. Ct. App. 2004) (observing it would be a breach of duty to fail to follow label instructions in the application of pesticides); Bennett v. Larsen Co., 348 N.W.2d 540, 549 (Wis. 1984) (overturning a judgment that dismissed a complaint alleging a breach of a duty of care for pesticide users established by administrative regulation).
. See Johnson v. Paynesville Farmers Union Coop. Oil Co., 817 N.W.2d 693, 700–01 (Minn. 2012) (considering claims for losses from spray drift); see also Alexandra B. Klass, Bees, Trees, Preemption, and Nuisance: A New Path to Resolving Pesticide Land Use Disputes, 32 Ecology L.Q. 763, 792–805 (2005) (discussing liability for property damage, crop damage, and/or personal injury).
. See, e.g., Macalpine v. Hopper, No. 10CV220, *9–10 (Colo. Dist. Ct., Delta Cnty., July 5, 2012) (enjoining spraying because the defendants’ drift caused throat and lung irritation and difficulties in breathing).
. See, e.g., United States v. Tropical Fruit, S.E., 96 F. Supp. 2d 71, 76–77 (D.P.R. 2000) (finding a violation of FIFRA due to the use of a registered pesticide in a manner inconsistent with its labeling). As scientists search for responses for herbicides that may be used on herbicide-resistant weeds, they may resort to herbicides such as dicamba that are known to present vapor drift damages. J. Franklin Egan & David A. Mortensen, Quantifying Vapor Drift of Dicamba Herbicides Applied to Soybean, 31 Envtl. Toxicol. & Chem. 1023, 1023 (2012) (studying vapor drift from applications of dicamba due to past experiences with damages to neighboring crops).
. See, e.g., Jacobs Farm/Del Cabo, Inc. v. W. Farm Serv., Inc., 119 Cal. Rptr. 3d 529, 551 (Cal. Ct. App. 2010) (concluding that plaintiff’s nuisance claim was viable for pesticide volatilization that harmed neighboring organic herbs); Johnson, 817 N.W.2d at 701 (precluding a trespass claim but finding evidence of a nuisance for damages related to spray drift).
. See Terence J. Centner, Securing Recompense under Nuisance Law for Crop Damages from Pesticide Applications, 432 Sci. Total Env’t 78, 79–80 (2012) (discussing nuisance law actions for pesticide drift).
. See Tropical Fruit, S.E., 96 F. Supp. 2d at 77–78 (alleging a violation of the pesticide label requirements); Ark. State Plant Bd. v. Bullock, 48 S.W.3d 516, 520 (Ark. 2001) (upholding a penalty imposed for violating a state regulation by allowing drift to enter nontarget properties); Patterson Flying Serv. v. Dept. of Pesticide Regulation, 74 Cal. Rptr. 3d 290, 303–04 (finding substantial drift from the target site in conflict with the proscription of the pesticide’s labeling requirement); In re N.C. Pesticide Bd., 509 S.E.2d 165, 169 (N.C. 1998) (acknowledging a violation of state pesticide regulations by applying a pesticide inconsistent with its label); Henderson v. Dept. of Agric., 875 P.2d 487, 489–90 (Or. Ct. App. 1994) (finding that the applicator and his employer applied pesticides in a manner inconsistent with the labels causing drift onto neighboring properties); see also Feitshans (1999), supra note 15, at 40–67 (summarizing liability for spray drift under statutory and regulatory authority).
. See, e.g., Mangrum v. Pigue, 198 S.W.3d 496, 500 (2004) (holding that the aerial spraying of an herbicide is not an ultrahazardous activity so the plaintiff could not maintain a strict liability cause of action); Dow Chem. Co. v. Ebling, 723 N.E.2d 881, 908–09 (Ind. Ct. App. 2000) (weighing factors pertaining to ultrahazardous activity and deciding that strict liability was not applicable to the use of the pesticide); see also Keith Cunningham-Parmeter, A Poisoned Field: Farmworkers, Pesticide Exposure, and Tort Recovery in an Era of Regulatory Failure, 28 N.Y.U. Rev. L. & Soc. Change 431, 478–80 (2004) (discussing liability for pesticide drift under strict liability for abnormally dangerous activities); Robert W. Luedeman, A Tale of Three States: Liability for Overspray and Chemical Drift Caused by Aerial Application in Arkansas, Louisiana, and Mississippi, 10 S.J. Agric. L. Rev. 121, 128 (2000) (observing that strict liability seems to be “more interesting to scholars than anyone else”).
. Every state has enacted anti-nuisance legislation known as right-to-farm laws. Terence J. Centner, Governmental and Unconstitutional Takings: When Do Right-to-Farm Laws Go Too Far?, 33 B.C. Envtl. Aff. L. Rev. 87, 87 (2006). See Stickdorn v. Zook, 957 N.E.2d 1014, 1024 n.5 (Ind. Ct. App. 2011) (observing that the state’s right-to-farm law offers a defense against nuisance actions); Kanna v. Benton Cnty., No. 17270-8-III, 1999 WL 219783, *9-10 (Wash. Ct. App. 1999) (observing that pesticide drift could be lawful under the state’s right-to-farm law).
. Bates v. Dow Agrosci., LLC, 544 U.S. 431, 447 (2005) (preempting state labeling requirements that are different from or in addition to labeling and packaging requirements).
. Trial courts have not been very receptive to claims for spray drift. See Mangrum, 198 S.W.3d at 500–03 (granting a directed verdict to the defendants on the negligence claim due to the absence of any evidence of a breach of a duty of care and no proximate causation); Kleiss v. Bozdech, 811 N.E.2d 330, 343–44 (Ill. Ct. App. 2004) (reversing a trial court’s finding that there was no negligence in the application of a pesticide); Johnson v. Paynesville Farmers Union Coop. Oil Co., 817 N.W.2d 693, 714 (Minn. 2012) (reversing a trial court's finding that there was no negligence in the application of a pesticide); Lesiak v. Cent. Valley Agric. Coop., Inc., 808 N.W.2d 67, 86 (Neb. 2012) (reversing a trial court’s finding that there was no negligence in the application of a pesticide).
. See, e.g., Fletcher v. Conoco Pipe Line Co., 129 F. Supp. 2d 1255, 1263 (S.D. Mo. 2001) (finding that stray voltage contamination causing physical damage to property presented evidence of a trespass); Ramik v. Darling Int’l, Inc., 60 F. Supp. 2d 680, 688 (S.D. Mich. 1999) (finding that noxious odors without damage to the res does not constitute a trespass).
. While state law and judicial decisions agree with this requirement, it does not address the issue of the character of invasions of intangible objects and their effect on exclusive possession. See In re Chi. Flood Litig., 680 N.E.2d 265, 277 (Ill. 1997) (concerning a physical invasion by water); Wendiger v. Forst Farms, Inc., 662 N.W.2d 546, 550 (Minn. Ct. App. 2003) (denying a trespass claim for odors); Beal v. W. Farmers Elec. Coop., 228 P.3d 538, 541 (Okla. Ct. Civ. App. 2010) (dismissing a trespass claim for stray electricity); Babb v. Lee Cnty. Landfill S.C., LLC, 747 S.E.2d 468, 476 (S.C. 2013) (rejecting a trespass claim for odors due to the absence of “an invasion by a physical, tangible thing”); John Larkin, Inc. v. Marceau, 959 A.2d 551, 556 (Vt. 2008) (rejecting a trespass claim involving air particulates).
. See Coastal Oil & Gas Corp. v. Garza Energy Trust, 268 S.W.3d 1, 12 n.36 (Tex. 2008) (noting injury may be slight or no damage at all); Johnson, 817 N.W.2d at 704 (noting no damages were required for trespass actions); Barnes v. Mathis, 353 S.W.3d 760, 764 (Tex. 201) (noting that trespass actions do not require damages).
. See Johnson v. Paynesville Farmers Union Coop. Oil Co., 817 N.W.2d 693, 701 (Minn. 2012) (noting the Restatement (Second) of Torts approves trespass actions for entry of things); Bradley v. Am. Smelting & Ref. Co., 709 P.2d 782, 785 (Wash. 1985) (quoting a comment from § 158 of the Restatement (Second) of Torts on what constitutes trespass).
. See, e.g., State v. Courchesne, 998 A.2d 1, 103 (Conn. 2010) (noting that “the fact finder may infer intent from the natural consequences of one’s voluntary conduct”) (citing State v. Cobb, 743 A.2d 1 (1999), cert. denied, 531 U.S. 841, (2000)); In re Methyl, Tertiary Butyl Ether (“MTBE”) Prods. Liab. Litig., 379 F. Supp. 2d 348, 417–18 (S.D.N.Y. 2005) (noting that intent under trespass does not require consequences that are desired); Brutsche v. Kent, 193 P.3d 110, 116 (Wash. 2008) (citing § 8A of the Restatement (Second) of Torts under which intent infers consequences that are substantially certain to result).
. See, e.g., Royal Ins. Co. v. Pinette, 756 A.2d 520, 523 (Me. 2000) (noting that defendant’s mistake, inadvertence, or negligence is immaterial if there was intent to be on the land).
. Judicial decisions on intangible objects focus on noise, odor, and light. See, e.g.,San Diego Gas & Elec. Co. v. Orange Cnty., 920 P.2d 669, 695 (Cal. 1996) (describing intangible invasions to include “noise, odor, or light”); Abington Ltd. P’ship v. Talcott Mountain Sci. Ctr. for Student Involvement Inc., 657 A.2d 732, 734 (Conn. Ct. App. 1994) (noting “noise, odor, or light” as intangible intrusions); Ramik v. Darling Int’l Inc., 60 F. Supp. 2d 680, 687 (E.D. Mich. 1999) (identifying intangible intrusions to include “noise, odor, or light”) (citing Wilson v. Interlake Steel Co., 32 Cal.3d 229, 233 (1982)). The Fifth Circuit Court of Appeals found that “airborne particles are neither direct nor tangible.” Stevenson v. E.I. DuPont de Nemours & Co., 327 F.3d 400, 405 (5th Cir. 2003). See Adams v. Cleveland-Cliffs Iron Co., 602 N.W.2d 215, 220 (Mich. Ct. App. 1999) (discussing differences between tangible and intangible invasions); Johnson, 817 N.W.2d at 702 (finding that the particulate matter of spray drift was an intangible substance).
. See infra notes 109–130 and accompanying text.
. See Ramik, 60 F. Supp. 2d at 688 (holding that odor without damage to the res is not an interference with possession and therefore does not constitute a trespass); Johnson, 817 N.W.2d at 702–03 (applying the results of an odor case to allegations of pesticide spray drift); Babb v. Lee Cnty. Landfill S.C., LLC, 747 S.E.2d 468, 476 (S.C. 2013) (finding “that odors cannot give rise to a trespass claim”).
. See Darney v. Dragon Prods. Co., 771 F. Supp. 2d 91, 105–07 (D. Me. 2011) (considering allegations of a trespass by airborne dust and blasting tremors).
. See Maddy v. Vulcan Materials Co., 737 F. Supp. 1528, 1540 (D. Kan. 1990) (observing that smoke without substantial damage to property is not a trespass); Paris v. Lussier, No. 2010-034, 2010 WL 7791942 (Vt. July 16, 2010) (considering allegations of a trespass by smoke, particulates, and/or carbon monoxide).
. See Wilson v. Interlake Steel Co., 649 P.2d 922, 924 (Cal. 1982) (finding that noise not damaging property does not constitute a trespass); Maddy, 737 F. Supp. at 1540 (observing that noise without substantial damage to the plaintiff’s property is not a trespass).
. See Barnett v. Conn. Light & Power Co., 900 F. Supp. 2d 224, 245–46 (D. Conn. 2012) (finding that alleged intrusions by intangible electromagnetic fields did not constitute a trespass).
. See infra notes 45–65 and accompanying text.
. See infra notes 66–84 and accompanying text.
. See infra notes 87–110 and accompanying text.
. Trespass is identified as an interference with exclusive possession while nuisance interferes with use and enjoyment. Martin v. Reynolds Metals Co., 342 P.2d 790, 792 (Or. 1959). This leads to a conclusion that intrusions interfering with the right to exclusive possession of property involve the law of trespass while intrusions to the interest in use and enjoyment of property involve nuisance law. Adam Mossoff, Spam—Oy, What a Nuisance, 19 Berkeley Tech. L.J. 625, 646 (2004). See San Diego Gas & Elec. Co. v. Orange Cnty., 920 P.2d 669, 695 (Cal. 1996) (finding intangible objects are not trespasses because they are actionable under nuisance law); John Larkin, Inc. v. Marceau, 959 A.2d 551, 553–54 (Vt. 2008) (noting that smoke, gas, noise, and invisible particles are only actionable as a private nuisance).
. See, e.g., Babb v. Lee Cnty. Landfill S.C., LLC, 747 S.E.2d 468, 479 (S.C. 2013) (observing that intangible invasions giving rise to nuisances cannot give rise to a trespass claim); Padilla v. Lawrence, 685 P.2d 964, 971 (N.M. Ct. App. 1984) (observing that intangible intrusions such as noise and odor are actionable under nuisance law rather than trespass) (citing Wilson v. Interlake Steel Co., 32 Cal.3d 229, 233 (1982)).
. Johnson v. Paynesville Farmers Union Coop Oil Co., 817 N.W.2d 693, 702–03 (Minn. 2012).
. Id. at 702 (noting that the disruption to a landowner’s exclusive possessory interest is different for intangible spray drift).
. Id. at 702. (citing Wendiger v. Forst Farms, Inc., 662 N.W.2d 546 (Minn. Ct. App. 2003)).
. Id. at 703–05 (citing Borland v. Sanders Lead Co., 396 So. 2d 523 (Ala. 1979) and Bradley v. Am. Smelting & Ref. Co., 709 P.2d 782 (Wash. 1985)).
. Wendiger v. Forst Farms, Inc., 662 N.W.2d 546, 550 (Minn. Ct. App. 2003).
. Johnson v. Paynesville Farmers Union Coop Oil Co., 817 N.W.2d 693, 705 (Minn. 2012).
. Barnett v. Conn. Light & Power Co., 900 F. Supp 2d 224, 245–46 (D. Conn. 2012).
. Adams v. Cleveland-Cliffs Iron Co., 602 N.W.2d 215, 221 (Mich. Ct. App. 1999) (rejecting the modern view of trespass that would eliminate the requirement of a direct invasion by a tangible object).
. See Restatement (Second) of Torts§ 821D cmt. e (1977); see also Lhotka v. U.S., 114 F.3d 751, 754 (8th Cir. 1997) (finding the plaintiffs had established a prima facie case in both nuisance and trespass); Borland v. Sanders Lead Co., 369 So. 2d 523, 527 (Ala. 1979) (maintaining that the same conduct of defendants may result in actionable invasions under both nuisance and trespass law); Cook v. Rockwell Int’l Corp., 564 F. Supp. 2d 1189, 1198 (D. Colo. 2008) (acknowledging that both the nuisance and trespass actions supported damages).
. Borland, 369 So. 2d at 527 (noting that nuisance and trespass are separate torts for the protection of different interests invaded by a defendant.
. Trespasses may involve invasions causing an interference with possession of property while nuisances consider invasions of personal rights and privileges. Lhotka v. U.S., 114 F.3d at 753–54.
. See Hoery v. U.S., 64 P.3d 214, 222 (Colo. 2003) (finding that “[t]he daily migration and presence of those chemicals on Hoery’s property constitute the continuing torts of trespass and nuisance”); Walker Drug Co. v. La Sal Oil Co., 902 P.2d 1229, 1234 (Utah 1995) (acknowledging that the plaintiffs could sue in trespass and nuisance); Stickdorn v. Zook, 957 N.E.2d 1014, 1024 (Ind. Ct. App. 2011) (allowing both nuisance and trespass actions for damages).
. See Wilson v. Interlake Steel Co., 649 P.2d 922, 925 (Cal. 1982) (observing that a trespass requires an invasion of exclusive possession while nuisance requires an interference with private use and enjoyment of property (quoting Prosser, Torts § 89 (4th Ed. 1971)).
. The most significant statutory defense that could affect actions for damages from spray drift involve state right-to-farm laws that operate to defeat nuisance lawsuits. See Kanna v. Benton Cnty.,, No. 17270-8-III, 1999 WL 219783, *9-10 (Wash. Ct. App. 1999) (observing that defendant could be shielded by the state’s right-to-farm law); Stickdorn v. Zook, 957 N.E.2d 1014, 1024 (Ind. Ct. App. 2011) (observing that the state’s anti-nuisance law offers a defense against nuisance actions but did not apply given the facts of the case).
. In some states, the statute of limitations for nuisance is shorter than for trespass actions. See Ex Parte Brian Nelson Excavating, LLC, 25 So. 3d 1143,1146 (Ala. 2009) (noting that there is a two-year statute of limitations for nuisance actions, but six year statute of limitations for trespasses).
. See Johnson v. Paynesville Farmers Union Coop. Oil Co., 817 N.W.2d 693, 701 (Minn. 2012); John Larkin, Inc. v. Marceau, 959 A.2d 551, 554 (Vt. 2008).
. See John Larkin, Inc., 959 A.2d at 554 (observing that absent a demonstrated physical impact, the airborne particles had not interfered with “the landowner’s right to exclusive possession of the land”).
. See Johnson, 817 N.W.2d at 701.
. See Kramer v. Angel’s Path, LLC, 882 N.E.2d 46, 56 (Ohio Ct. App. 2007) (declining to find that light involved a physical intrusion needed to support a trespass allegation).
. See Macalpine v. Hopper, No. 10CV220, at *3 (Colo. Dist. Ct., Delta Cnty., July 5, 2012) (finding that the plaintiffs had felt the spray drift); Stevenson v. E.I. DuPont de Nemours & Co., 327 F.3d 400, 406 (5th Cir. 2003) (acknowledging that airborne particulates can show a substance entering property to support a cause of action in trespass).
. Johnson, 817 N.W.2d at 702.
. Id. at 701–02 (citing James A. Henderson, Jr. et al., The Torts Process 386 (7th ed. 2007)).
. Id. at 705 (observing there was no claim that a tangible object invaded plaintiffs’ property).
. Id. at 713 (finding the plaintiffs still had a viable nuisance claim).
. 959 A.2d 551 (Vt. 2008).
. No. 10CV220 (Colo. Dist. Ct., Delta Cnty., July 5, 2012).
. See supra note 29 and accompanying text. See also Randall Bezanson & Andrew Finkelman, Trespassory Art, 43 U. Mich. J.L. Reform 245, 290 (2010) (concluding that the new rubric for intangible trespasses under Oregon law requires substantial injury); Woodrow Barfield, Commercial Speech, Intellectual Property Rights, and Advertising Using Virtual Images Inserted in TV, Film, and the Real World, 13 UCLA Entertain. L. Rev. 153, 171 (2006) (noting that a damage requirement applied to an invasion of noise); Borland v. Sanders Lead Co., 396 So. 2d 523, 529 (Ala. 1979) (delineating four requirements for trespasses involving intrusions of particulate matter); Pub. Serv. Co. of Colo. v. Van Wyk, 27 P.3d 377, 390 (Colo. 2001) (requiring physical damage to property).
. See, e.g., Borland, 396 So. 2d at 529 (delineating a requirement of substantial damages to a res); In re Worldcom, Inc., 546 F.3d 211, 219 (8th Cir. 2008) (noting that substantial damage to land is needed before a light pulse could be found to effect a trespass).
. See, e.g., Van Scoy v. Shell Oil Co., No. 95-15961, 1996 WL 563449, *1-2 (9th Cir. 1996) (noting the absence of proof of excess material being deposited on plaintiff’s property so that there was no action in trespass).
. See Johnson v. Paynesville Farmers Union Coop. Oil Co., 817 N.W.2d 693, 703 (Minn. 2012); John Larkin, Inc. v. Marceau, 959 A.2d 551, 555 (Vt. 2008).
. See, e.g., John Larkin, Inc., 959 A.2d at 551. See also supra note 30.
. 396 So. 2d 523, 527–28 (Ala. 1979). The Borland court relied on the earlier Martin v. Reynolds Metals Co. case, 342 P.2d 790, 794 (Or. 1959).
. 396 So. 2d at 529.
. Id. at 528–29 (relying on Martin v. Reynolds Metals Co., 342 P.2d 790 (Or. 1959)).
. See, e.g., Darney v. Dragon Prods. Co., 771 F. Supp. 2d 91, 105–07 (D. Me. 2011) (discussing the modern view of trespass law for airborne dust and the requirement of “proof of damage to the invaded property”) ; Bradley v. Am. Smelting & Ref. Co., 709 P.2d 782, 689 (Wash. 1985) (declining to cling to outdated doctrines and recognizing the abandonment of distinguishing between direct and indirect invasions).
. See Bradley, 709 P.2d at 690 (accepting the Borland elements of trespass law that include substantial damages to the res).
. See, e.g., id. at 691 (accepting and approving the four elements set forth in Borland for airborne particulates); In re Worldcom, Inc., 546 F.3d 211, 219 (8th Cir. 2008) (noting that invasions by intangibles may not interfere with possession unless there is substantial damage to the res). The justification for requiring substantial damage to a res for intangible invasions is to preserve trespass’s focus on interferences with rights of possession. Id.
. See In re Worldcom, Inc., 546 F.3d at 219 (noting that a trespass of light pulses would require an allegation of substantial damage to land).
. See San Diego Gas & Elec. Co. v. Orange Cnty., 920 P.2d 669, 695 (Cal. 1996) (noting that intangible intrusions of light, noise, and odor alone were not trespasses); Ramik v. Darling Int’l, Inc., 60 F. Supp. 2d 680, 688 (S.D., Mich. 1999) (finding odors were not trespasses); Babb v. Lee Cnty. Landfill S.C., LLC, 747 S.E.2d 468, 476 (S.C. 2013) (finding that odors do not give rise to a trespass claim).
. See Barnett v. Conn. Light & Power Co., 900 F. Supp. 2d 224, 239 (D. Conn. 2012) (noting that an intangible intrusion of an electromagnetic current is not a trespass). Yet if a plaintiff pleads a physical presence causing damages, stray electric voltage may raise a claim for trespass. Fletcher v. Conoco Pipe Line Co., 129 F. Supp. 2d 1255, 1263 (S.D. Mo. 2001) (observing that the claim of accelerated corrosion of metal structures and other damages presented evidence of a trespass).
. See Beal v. W. Farmers Elec. Coop., 228 P.3d 538, 541 (Okla. Ct. App. 2009) (noting that intangible invasions must cause physical damage to property) (citing 75 Am. Jur. 2d Trespass § 27 (2000)).
. See id. (coupling exclusive possession with an intentional invasion, foreseeability, and substantial damage to property for intangible intrusions). An interference with exclusive possession may require substantial damages. See Paris v. Lussier, No. 2010-034, 2010 WL 7791942 (Vt. July 16, 2010), *1 (differentiating intangible trespass actions to require substantial damages).
. Cook v. Rockwell Int’l Corp., 618 F.3d 1127, 1148–49 (10th Cir. 2010).
. Fletcher v. Conoco Pipe Line Co., 129 F. Supp. 2d 1255,at 1263 (S.D. Mo. 2001).
. Stevenson v. E.I. DuPont de Nemours & Co., 327 F.3d 400 (5th Cir. 2003).
. Id. at 406. The court rejected the argument that substantial damage to the property was required. Id.
. Id. at 403 (affirming the jury verdict that defendant was liable for a trespass).
. Macalpine, at *6 .
. See Mayeux v. Cane-Air, Inc., 426 So. 2d 305, 308 (5th Cir. 1983) (involving damages to a soybean crop); Schoppe v. Applied Chems. Div., Mobley Co., Inc., 418 So. 2d 833, 835 (Miss. 1982) (considering damage to cotton and soybean crops).
. See John Larkin, Inc. v. Marceau, 959 A.2d 551, 555 (Vt. 2008) (finding that in the absence of “a demonstrated physical impact” on plaintiffs’ property, there could not be a trespass).
. U.S. Dep’t of Agric., 2010 – 2011Pilot Study Pesticide Residue Testing of Organic Produce, at 2, Nov. 2012 (last visited Feb. 3, 2014) (noting the use of testing to determine the presence of pesticide residues).
. A&L Can. Labs., Inc., Pesticide Residue Analysis. A&L Can. Labs. Inc., at 2 (last visited Feb. 3, 2014) (delineating a sampling procedure for plant tissues).
. A&L Can. Labs., Inc., id. ; European Comm’n Health & Consumer Protection Directorate-General, Guidance document on analytical quality control and validation procedures for pesticide residues analysis in food and feed, SANCO/12571/2013, Nov. 19, 2013, at 2 (last visited Feb. 3, 2014).
. See, e.g., Williams v. Illinois, 132 S. Ct. 2221, 2239 (2012) (delineating conventional chain-of-custody evidence).
. Applicators of restricted use pesticides will have these records due to a requirement under FIFRA. See 7 C.F.R. § 110.3 (2013).
. See F.M. Fishel & J.A. Ferrell, Managing Pesticide Drift, Univ. of Fla. Inst. of Food and Agric. Sci. Extension, 3–5 (last visited Feb. 3, 2014) (discussing how wind, air temperature, and relative humidity affect spray drift).
. See Mayeux v. Cane-Air, Inc., 426 So. 2d 305, 308 (5th Cir. 1983) (demonstrating how an expert witness testifies to establish damage to a crop from exposure to a pesticide); Schoppe v. Applied Chems. Div., Mobley Co., Inc., 418 So. 2d 833, 835 (Miss. 1982) (using expert witnesses to establish the amount of loss from pesticide drift).
. John Larkin, Inc. v. Marceau, 959 A.2d 551, 555 (Vt. 2008).
. The unauthorized physical changes to plant materials caused by a defendant’s spray drift, identifiable through testing and records of spray applications, would establish that the defendant’s use of a pesticide caused the damage.
. Darney v. Dragon Products Co., LLC, 994 A.2d 804, 807 (ME 2010).
. E.g., Johnson v. Paynesville Farmers Union Coop. Oil Co., 817 N.W.2d 693, 702 (Minn. 2012) (equating spray drift with smells).
. Stevenson v. E.I. DuPont de Nemours & Co., 327 F.3d 400, 406 (5th Cir. 2003).
. Macalpine v. Hopper, No. 10CV220, *9–10 (Colo. Dist. Ct., Delta Cnty., July 5, 2012).
. However, many states have rejected the modern theory. See In re Worldcom, Inc., 546 F.3d 211, 217 (8th Cir. 2008) (discussing the modern view of trespass that recognizes intangible invasions but finding the invasion had not caused substantial damage to plaintiff’s land); Darney v. Dragon Prods. Co., 771 F. Supp. 2d 91, 105–07 (D. Me. 2011) (considering the modern view of trespass for an intrusion of dust particles but finding no viable trespass claim given the absence of proof of damage to the invaded property); John Larkin, Inc. v. Marceau, 959 A.2d 551, 554–55 (Vt. 2008) (acknowledging the modern theory of trespass allowing claims for intangible airborne particulates but dismissing the trespass claim due to the absence of a physical impact interfering with exclusive possession).
. See In re Tenn. Valley Auth. Ash Spill Litig., 805 F. Supp. 2d 468, 484 (E.D. Tenn. 2011) (finding that invasions of intangible particles in Tennessee are trespasses without a showing of actual or substantial harm); Stephens v. Koch Foods, LLC, 667 F. Supp. 2d 768, 794–96 (E.D. Tenn. 2011) (adopting the modern view of trespass to allow a claim for trespass of gasses to proceed).
. See Restatement (Second) of Torts§ 821D cmt. e (1977). Copyright 2014 Terence J. Centner. All rights reserved. On Friday, February 7th, Berkeley Law’s Ecology Law Quarterly and Center for Law, Energy, and the Environment are proud to host their symposium, The Berkeley Exchange: Celebrating Berkeley’s Contribution to Environmental Law Scholarship. This academic symposium will feature Berkeley Law alumni discussing their latest research, followed by an evening reception. We invite all Berkeley Law and ELQ alumni to join us for a celebration and reunion after the close of the symposium. Even if you cannot attend the symposium, we invite you to join us. Symposium registration is free. Reception by donation. To register for the symposium or reception, please click here and fill out the form. Questions? Comments? Please contact Symposium Co-Director Patrick Metz at ELQsymposium@gmail.com. On September 30, 2008, California passed the Sustainable Communities and Climate Protection Act, or SB 375. The legislation was the first in the country to link land use, transportation, and housing planning with global warming. The nation’s attention was once again focused on California’s efforts to address global climate change through innovative regulation. Three years before, the legislature had passed The Global Warming Solutions Act of 2006, or AB 32, which requires the state to reduce greenhouse gas (GHG) emissions to 1990 levels no later than 2020. Since passenger vehicles account for approximately thirty percent of the state’s total emissions and their numbers have increased drastically from 1990 levels, it was generally accepted that without improved land use and transportation policies, California would not be able to achieve the goals of AB 32. The general concept is that movement away from low-density suburban “sprawl” and toward higher-density, transit-oriented development that is less dependent on the private automobile would lead to lower GHG emissions. SB 375 has three goals: (1) to use the regional transportation planning process to help achieve the goals of AB 32; (2) to provide possible streamlining of California Environmental Quality Act (CEQA) procedures for residential projects, helping achieve the GHG emissions reduction goals; and (3) to coordinate the regional housing needs allocation process with the regional planning process. It builds upon existing regulatory structures and seeks to incentivize more compact development through project funding and process streamlining. This Article will discuss the legislative history behind SB 375, the current language of the statute, what compromises were made in developing its final language, what potential obstacles may arise in implementing the law, and suggestions on additional legislative and administrative steps that should be taken to practically achieve its goals. Food justice is the notion that everyone deserves healthy food and that the benefits and risks associated with food should be shared fairly. The concept borrows its distributional equity framework from the environmental justice movement, its focus on access to food from the community food security movement, and its interest in food environments from research in the public health and food systems fields. Unfortunately, disparities in access and health mean that food justice is currently an aspiration rather than a reality in many low-income communities. This article examines the food retail landscape in Los Angeles and briefly summarizes some programs that could increase food access and quality in underserved communities. In describing these opportunities, this article shows how L.A. residents, advocates, and policy makers have begun and can continue to survey their food environments, attract more supermarkets and hold food retail firms accountable; partner with corner stores to offer more healthy choices; limit fast food restaurants and improve nutrition information at chain restaurants; promote healthy mobile food vending; and establish farmers’ markets and re-envision these markets as hubs for local food distribution. Some of these efforts have been underway for years, while others are new experiments. Together they comprise a diverse set of interconnected measures to promote food justice by improving food retail in low-income areas. Trains carry goods 94 percent more efficiently than do trucks. California should therefore encourage firms to ship goods on trains, not trucks. Yet the California Air Resources Board (CARB), in its draft Scoping Plan, ignores the huge gains the state could enjoy if it simply used more trains. Earlier this year, the U.C. Berkeley School of Law’s California Center for Environmental Law & Policy (CCELP) sponsored and hosted a major conference, “California & the Future of Environmental Law & Policy.” The purpose of this successful event, which brought together government policymakers, practicing attorneys, scholars and students, was to explore California’s leadership role—regionally, nationally and globally—in formulating and implementing effective environmental policy. The CCELP conference focused on the most critical environmental challenges facing California, the United States and the international community. Panels of experts debated issues of climate change regulatory policy, alternative energy resource development, ocean and coastal issues, necessary linkages between regional land use and transportation policy, water allocation in an era of increasing scarcity, the so-called “Green Chemistry” movement’s efforts to reform hazardous waste policy, and the potential and limitations of litigation as a tool of climate change policy. Another highlight of the conference was the diverse group of plenary speakers: Peter Gleick, president of the Pacific Institute, who spoke on the role water conservation can play in addressing looming domestic and international water shortages; Jared Huffman, environmental lawyer and advocate-turned-state legislator, who shared his environmental vision and platform; and Nobel Prize winner Stephen Chu, director of the Lawrence Berkeley Laboratory at U.C. Berkeley, who offered his sage commentary on the energy-related challenges facing California and the world. Several of the stimulating and insightful presentations from this conference are distilled in the articles, authored by conference participants, found in this issue of Ecology Law Currents. I commend them to your attention. In the same spirit, I offer these introductory comments to summarize my own thoughts—first presented at the conclusion of the CCELP conference—as to how well (or poorly) California has served as national and international leader when it comes to environmental law and policy. The bottom line: in some instances, California has more than lived up to its billing as environmental pioneer and visionary—the envy of the national and international community. In other environmental policy contexts, California gets better marks than the federal government and many of its sister states, but is merely keeping pace with much of the international community. In still others, the State of California has underperformed and, indeed, has much to learn from other states and nations. Accelerated climate change is the preeminent environmental and economic issue of our time. Unless we change course now, it will be the preeminent issue for the next generations also. Recognizing the situation, the Legislature passed Assembly Bill 32, California Global Warming Solutions Act of 2006. This law put California at the forefront of taking action to combat global warming by establishing aggressive goals for reduction of greenhouse gas (GHG) emissions. The goal of AB 32 is to reduce our greenhouse gas emissions to 1990 levels by the year 2020. We cannot just slow down the rate at which GHGs are being emitted—we must go further and in effect turn back the clock. The recent enactment of SB 97 has codified the California Attorney General’s argument that increased greenhouse gas emissions and their effects constitute an environmental impact that must be considered by a permitting agency under the California Environmental Quality Act (CEQA). This new measure will make many CEQA reviews more complex, and will require more costly mitigation measures for many projects, but it also provides some potential opportunities, particularly for renewable energy developers. This Article looks at the implementation of SB 97 and some of its possible ramifications.